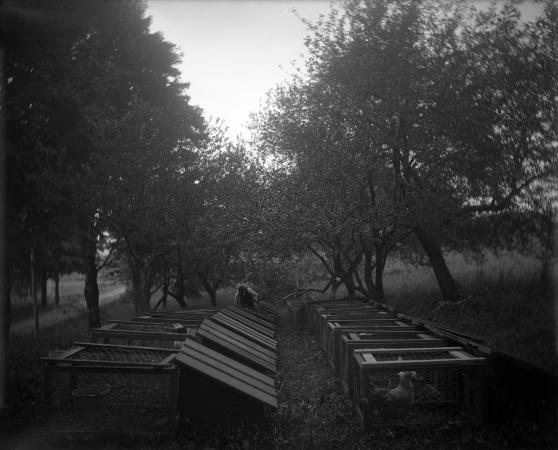 View of a man tending to captive birds at the Middle Island State Game Farm at Middle Island in Brookhaven, Suffolk County on Long Island. The date is unrecorded, but is probably ca. 1920 (the farm was established in 1914). There are two rows of wire cages, but the interiors of only the two nearest are visible. A bird of indeterminate species can be seen in one. This image was created to record the game bird farm activities of the New York State Conservation Commission. Source: New York State Archives, New York (State). Conservation Dept. Photographic prints and negatives, [ca. 1904-1949], 14297-87, SARA No. 219.